A proxy form must be in writing, dated and signed by the relevant shareholder. The question is what form must that take? Is an email or a pdf “in writing”? Can the shareholder use an electronic signature? Must it be an advanced electronic signature? Can a shareholder simply send an email to the company secretary, appointing someone as a proxy? Can a proxy be given electronically? These are important questions to answer because if the answer is yes, it can save a huge amount of time and hassle. The common practice when getting shareholders to appoint a proxy is to email them the proxy form, and ask them to print, sign and date it, and then scan and email it back. 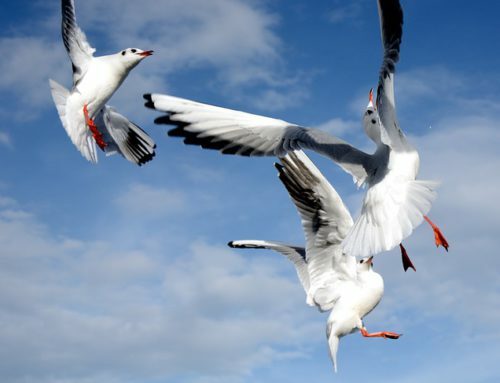 Shareholders often do not complete the proxy form and send it back because it is a hastle. If many shareholders do not complete the proxy and will not be attending the meeting, a quorum may not be met. The company secretary then has to phone all the shareholders and scramble to ensure that a quorum will be met. Email is a much easier and quicker way to appoint a proxy. “Writing” is not defined in the Companies Act 71 of 2008 (Companies Act), so we turn to the Electronic Communications and Transactions Act 25 of 2002 (ECT Act) to provide us with a definition. The ECT Act states that the requirement of writing is met if a document or information is “(a) in the form of a data message; (b) and accessible in a manner usable for subsequent reference“. An email is a data message, and would therefore meet the requirement of “writing”. Section 6(12) of the Companies Act states that if a section of the Act requires a document needs to be signed or initialled, the signing or initialling “may be effected in any manner provided for in the ECT Act”. This means that documents can now be easily signed with an electronic signature. The ECT Act defines an electronic signature as “data attached to, incorporated in, or logically associated with other data and which is intended by the user to serve as a signature“. A simple signature at the end of your email is intended to ‘”serve as a signature”. Section 28(2) prescribes that the proxy must be dated. The date that the email was sent would meet this requirement. However, you can also choose to include a date in the proxy form. The appointment of a proxy is valid for a year after the date of signature, but can be shorter or longer if you have expressly changed it in the appointment. The proxy can be revoked unless it expressly states otherwise. The proxy is suspended if the shareholder chooses to act directly and in person as a shareholder. What does your MOI say? Your memorandum of incorporation (MOI) contains alterable provisions relating to a proxy, so you must check that your specific MOI does not impose requirements for the appointment of a proxy. The person sending the notice of the AGM to shareholders can simply say. 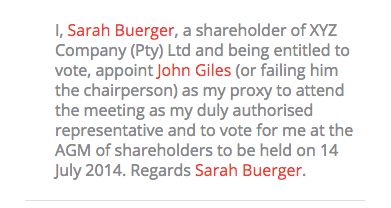 I, Sarah Buerger, a shareholder of XYZ Company (Pty) Ltd and being entitled to vote, appoint John Giles (or failing him the chairperson) as my proxy to attend the meeting as my duly authorised representative and to vote for me at the AGM of shareholders to be held on 14 July 2014. Regards Sarah Buerger. What is an Appointment of Director?